Last month I attended Dare 2 Share’s Evangephobia webinar and actually enjoyed it! I know that sounds like I’m a bit surprised that I did, but it’s true — my expectations were pretty low considering the typical nature of webinars, but Dare 2 Share pulled it off very nicely. Greg Stier presented very helpful content and trained us about the fears surrounding evangelism. It was very interactive with questions and polls, informative, inspiring and encouraging. And for the price of FREE, you can’t be the price. Perhaps my favorite part was watching the live chat feed that accompanied Greg’s live video feed. There’s something about a couple hundred youth workers having the opportunity to talk “out loud” to other without interrupting “the speaker on stage.” The thoughts we normally think but never say out loud during a presentation all come out and man, it’s hilarious! But, to be fair, the chat was also a great place for us to dialoge about what Greg was saying while he was saying it. It was kinda like a huge small group discussion and reflection time during the message instead of having to break into groups afterwards and try to remember what was said earlier. 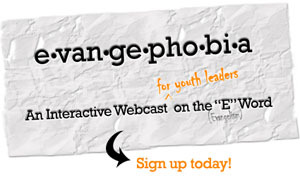 Because of the positive response Dare 2 Share received, they’re holding two more Evangephobia webinars over the summer so more of you can attend and engage in the conversation about evangelism’s role in youth ministry. If you missed out on the first one, be sure you don’t miss one of the next two webinars! Make sure you go sign up and put the date on your calendar! Your time attending the Evangephobia webinar is well invested (and fun! ).